In keeping with my obsession with all things historic, I couldn’t help but grab for this title. 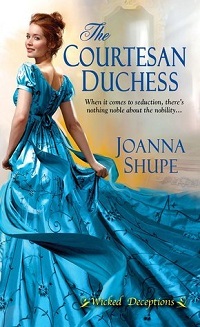 This new series from debut author Joanna Shupe promises wonderful things to come! Please read on for the review and excerpt, check out the other tour stops and don’t forget to enter the tour-wide giveaway where you could win one of 3 Print Copies of The Courtesan Duchess. I love the title, so oxymoronic in the meaning and yet so wonderfully evocative. A premise of revenge and settling of old debts stars this story with a bang, in Venice. Julia has established a life in Venice, purporting to be a famed courtesan. Her marriage eight years back was singularly unspectacular, and her husband, the Duke of Colton hasn’t bothered with her since. There was a curious mix of naiveté and worldliness in Julia: she wants to tease and torment her husband, but she also hopes to find that sort of love she has dreamed of, whether or not with him. Nick, the Duke was far less straightforward: while cavorting with everything in a skirt since he left his very young (just 16 years old) wife to fend for herself, he’s not met a moment of hypocrisy that he can’t fully get behind. While he’s been playing the field with no compunctions, the mere suggestion of Julia being unfaithful is abhorrent. OK, so we are in titled relationships and the surety of the heir’s parentage is important, he’s got little wiggle room. But, Nick does have his own reasons for his bad behavior that extend past selfishness, although none really feel entirely justified in my mind. He could be terrifically hateful, and his mouth often ran before his brain was engaged. But – I digress: Julia’s deception worked for her, she saw the kindly and often flirtatious Nick that was so long missing in her life. And he had moments that were sweet and showed his more vulnerable side. She’s heading for that happy ending, and Nick will follow if she has her way. Secondary characters were lovely: the courtesan who helped Julia to navigate the life was particularly interesting, and glimpses of Nick’s devotion to his daughter also added to the story. Additionally, there are characters introduced that are sure to be stars of their own stories: all with a rather unusual pathway to their happy ending. This is a story full of sensuality and sexuality: while connections appear quickly they do not overwhelm the plotting or forward motion of the story. The plot is fast-paced without overloading readers with details from the past that are superfluous in the present. A few misses with the language use where Americanisms are used rather than British distract slightly but not overmuch, I’m just disappointed to see simple mistakes in what was otherwise a truly enjoyable and fun story. Julia needed a male child, a legitimate one, to serve as the heir to the Colton estate. Only then could she thwart Templeton’s designs on the dukedom. Her plan was foolproof. Six months ago, Julia had sold off all her remaining jewelry in order to secretly hire Pearl Kelly, London’s true reigning courtesan, to offer advice. Pearl had proved a veritable fount of information, telling Julia precisely how to dress, act, speak, and flirt like a Cyprian. Pearl had even helped design Julia’s gowns along with the courtesan’s own modiste. The resulting wardrobe was luxurious and elegant with sumptuous fabrics and daring necklines, such as the deep emerald green gown she wore tonight. The undergarments had been ordered from Paris, and they still made Julia blush. Her jewelry had posed a problem, since every good piece she’d owned had been sold off over the past two years. So Pearl had graciously loaned Julia several stunning sets, which included the expensive diamond and pearl necklace now around her neck. Julia had also learned how to use creams and paints to best enhance her features. Earlier, she’d applied a dusting of white pearl powder on her face, rose pink rouge on her lips and cheeks, and a light coating of lamp-black on her lashes and eyebrows. The enhancements combined with her red hair made her completely unrecognizable to anyone familiar with the blond and understated Duchess of Colton. A black eyebrow shot up, and he gave a devilish grin that would surely melt the insides of a weaker woman. “Winchester, I am beginning to envy you,” Colton murmured, his smoky gray gaze never leaving hers. “As you should. I am entirely at Mrs. Leighton’s whim.” Simon’s intimate smile left no doubt as to the nature of their relationship. Simon flashed her a besotted glance that would’ve had Julia laughing under any other circumstance. “Anything for you, love.” He walked away to leave Julia alone with the husband she hadn’t seen in eight years. She should be tongue-tied, she thought, as she regarded the man who wielded enormous power over her, even from such a great distance. But considering the hot gleam of male interest in Colton’s eyes, the way he studied her carefully, Julia knew the control now lay in her own hands. “Your Grace,” she started, then boldly moved closer and took his arm. “I feel as if we already know one another.” Julia led him toward the terrace doors. “Then, by all means, you must call me Nick. I’ve never been fond of my title.” Tall and lithe, he leaned casually against the terrace railing, the backdrop a surprisingly clean stretch of canal. He was even more handsome up close. His shoulders were broad, and power lurked beneath his finely tailored clothing. She suddenly felt so . . . alive and edgy in his wickedly alluring presence. Little wonder her husband had become such a rake and scoundrel. “Here you are, love.” Simon appeared with a glass of champagne. Two years! Julia gasped and almost choked on a mouthful of champagne. Simon had seen her husband two years ago? If Colton weren’t standing here, she would give Simon a good kick in the leg for not telling her. Pawn? What on earth? Julia could scarcely wait to get Simon alone in order to get answers. Simon held up his hands in surrender. “I have no wish to quarrel with you. Especially in front of such a beautiful woman.” He slid his arm around Julia and gave her shoulders a reassuring squeeze.